pokerstars Created with Sketch. casino Created with Sketch. casino-unselected Created with Sketch. betstars Created with Sketch. betstars-unselected Created with Sketch. Poker might be the greatest game in the world but for a month every four years it has some competition. The World Cup is the stuff that dreams are made of… A massive global event watched by millions all eager to find out which of Brazil, Germany, France or Spain will lift the trophy. That’s not to say that everything about it is predictable – we’re not sure whether England will go out in the Last 16 or the quarter-finals in Russia this summer… It’s a tough call. If you think you know the answer, you’ll want to get involved in the phenomenal Stars £100m Challenge. All you have to do to win the crazy life-changing first prize of £100m is correctly predict the outcome of each match in this summer’s festival of football – win, lose, or draw – and it’s completely free to enter. The action kicks off on June 14, with hosts Russia up against footballing giants Saudi Arabia. If you can’t wait that long for your fix, join us now as we count down the 10 best footy video games of all time. Unlike England, all of these had a shot at the top spot but only one went on to lift the trophy. The second-best top-down football game ever made, Kick Off was developed by Brit Dino Dini in 1989, and it laid the ground for Sensible Soccer three years later. Fast and frantic, it called for more skill and dexterity than most other football games, with the ball bobbling ahead of you rather than being glued to your foot. Dini tried hard to make a comeback with Kick Off Revival in 2015, but it was slammed by critics and labeled the worst football game ever made by Vice. Ouch. Anyone remember the Tehkan World Cup arcade game? It was the first multiplayer football game with trackballs to make you feel like you’d actually played 90 minutes afterwards, and it was quite brilliant. This take on it was developed by Sensible Software’s Jon Hare. He went on to make an even better football game five years later but this one, with crazy banana shots and thunderstorms that impacted your slide tackles, was a hell of a lot of fun. Little-known fact: It was released in the States as Keith Van Eron’s Pro Soccer. Who? A real oddity but in many ways this was the FIFA of its time. Taking inspiration from the 1983 game International Soccer, it came with a huge amount of options, including the ability to edit your team, customize strips and enter a league with up to three friends. It also tried its best to replicate the full gamut of moves so you could sidestep, barge and head the ball, or try back-heels, lobs and diving headers. All with just one fire button. The graphics might look laughable now but they were fairly comical back then, and very similar to the original that came out five years earlier. The gameplay was top notch though. It was always a little clunky, but Virtua Striker’s place in the history books is assured as the first football game to be played in full 3D. Taking its aesthetics from the Virtua Fighter series, it had people swarming around its cabinet on release and, although hard to believe now, was seen as the pinnacle of realism at the time. Simple controls meant you could rock up and play easily enough but there wasn’t enough depth to make it a real classic. Built on Gremlin Interactive’s brilliant Actua Soccer, the first 3D footy game on consoles (and an obvious take on the Virtua Striker arcade game), Euro 96 was the official version of the brilliant tournament held in England. It looked utterly brilliant for its time and passed the torch to PES and FIFA, which both went on to make all the money. The very excitable Barry Davies on commentary was one of the big highlights of this game: “Cantonaaaaaa”. Okay hands up, this isn’t strictly speaking football but a weird hybrid where you control vehicles rather than players. The aim, however, is the same – score more goals than your opponent – and it would be doing the world an injustice not to include it here. No one predicted Rocket League would get as big as it has – it was the biggest-selling game in the PlayStation Store in 2016 – but it’s a pulsating, arcade-like delight, with more strategy to it than meets the eye. 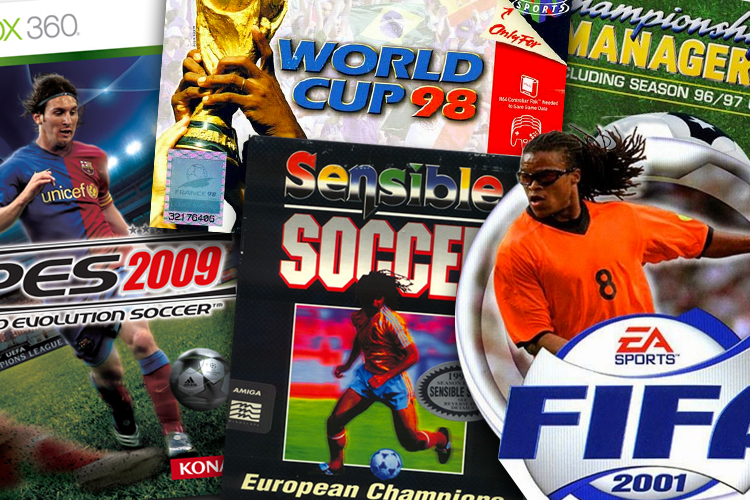 If you’ve been brought up on a diet of FIFA and PES, you missed out on a world-beating classic. Sensible Soccer took the best bits of Kick Off, including the top-down view, tweaked everything until the gameplay was near perfection, and then tweaked it some more to add a management element to SWOS. The mere mention of the game will make grown men weak at the knees and it rightfully takes its place near the top of this list with the legends of the game. Which PES is the best PES? It’s a debate that’s had experts arguing for years and while some would say PES 6, we don’t think the game that used terrifying Italian referee Pierluigi Collina on the cover has been bettered in terms of pure fun and excitement. Each iteration of the game might have improved the graphics and added depth and realism, but for jump-up-in-the-air celebrations and bitter recriminations over dodgy goals, PES3 is the one we’ve had the most fun playing. When it comes to the seminal Football Manager series, you’d be hard pressed to find a version that isn’t good. However, Championship Manager 00/01 (as it was once called) and Football Manager 14 are the best. They’re more spreadsheet than game and you’re Arsene Wenger rather than Pierre-Emerick Aubameyang, but for purists (and people who like less fun in their games) they’re exceptional. Their success comes from the incredibly detailed stats on every known player in the world. Your job is to find the best combos and turn them into a team of ruthless winners. PES was always seen as the football fans’ game of choice, with FIFA the brash and gaudy alternative. That changed with FIFA 12, which put EA’s behemoth on top with a new impact engine that made the game feel more realistic than ever. FIFA 18 is the best version yet and has converted all but the most die-hard PES fans. Never known for giving away anything, even when you’ve bought the game, EA should also be commended for releasing the 2018 FIFA World Cup expansion pack for free, from May 29, just in time for the start of the tourney. Copyright © 2001-2019, Rational Intellectual Holdings Limited. All rights reserved. Rational Entertainment Enterprises Limited, Douglas Bay Complex, King Edward Road, Onchan, IM3 1DZ, Isle of Man. License renewed March 10, 2014. Online gambling is regulated in the Isle of Man.